New Peterborough United signing Chris Forrester on his debut at Millwall. New Posh recruit Chris Forrester is confident he can make a successful step up in standard from Irish football. 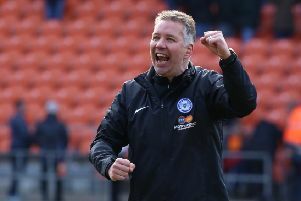 Ireland has not been a happy hunting ground for Posh in recent seasons despite obvious connections either side of the border in Darragh MacAnthony and Grant McCann. Midfielder Danny Kearns showed promise when former Posh boss Darren Ferguson brought him across the water from Dundalk in 2011, but fast forward four years and he’s just been released by League Two side Carlisle United. There’s little chance of coming back from that disappointment. Centre-forward Joe Gormley has so far failed to live up to his free-scoring reputation since moving from Cliftonville earlier this summer so Forrester has a trend to buck. “It’s going to be a challenge for me,” admitted Forrester, who signed a three year-deal for an undisclosed fee after agreeing to leave League of Ireland club St Patrick’s Athletic. “But I’m 22 now and I feel the time is right to come over and try and make my name in the Football League. “I’d been thinking about it for a while, but I had to make sure it was the right club. “When Peterborough showed an interest in me I did some research and I liked what I found. Peterborough have a good record recently in giving younger players a chance so I was happy to talk to them. “It dragged on for a couple of weeks, but I was glad when the transfer was finally completed. “I spent a couple of days training with the team before I signed and I was soon confident I’d made the right choice. “I signed on Saturday and watched the game against Gillingham. It was a decent game and we played well. “I felt we deserved to win. The spirit to come back after conceding a late goal was impressive though. “The lads made me feel very welcome from the start and it was good to hear plenty of Irish accents among the English ones! “I seemed to be up to speed fitness-wise so the aim now is to cement a place in the first team. “My preferred position is the centre of midfield as I feel I can impact games more from there. Forrester started his career at Bohemians before moving to St Patrick’s in 2012. He quickly earned a reputation for scoring quality goals from midfield. He averaged close to a goal every three games, form that earned him Ireland Under 21 caps. Posh right-back Michael Smith started his career in Irish football and he transferred his excellent form with Ballymena United to Bristol Rovers and Posh. Forrester made his Posh debut at Millwall on Tuesday.